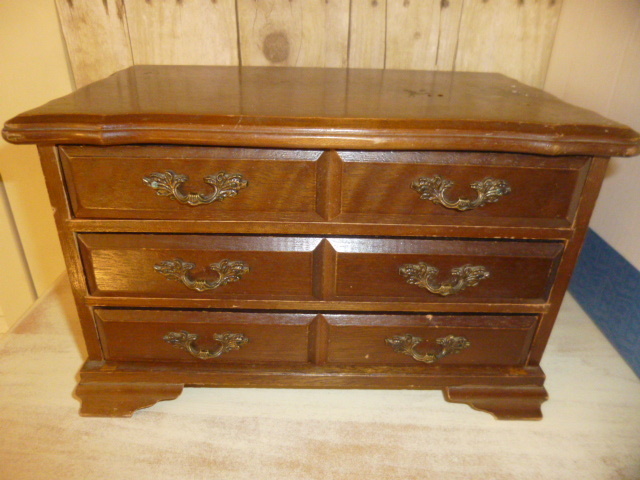 Small wood jewelry chests are an item that I am always on the hunt for. They are fairly quick to make-over (IF you pick & choose carefully!) and usually sell quite well. This was a great medium sized one! I normally see a LOT of the small ‘2 drawer’ kinds and the HUGE ones. This one is just right. POP QUIZ: What’s the FIRST thing you do when you spot an item like this??? 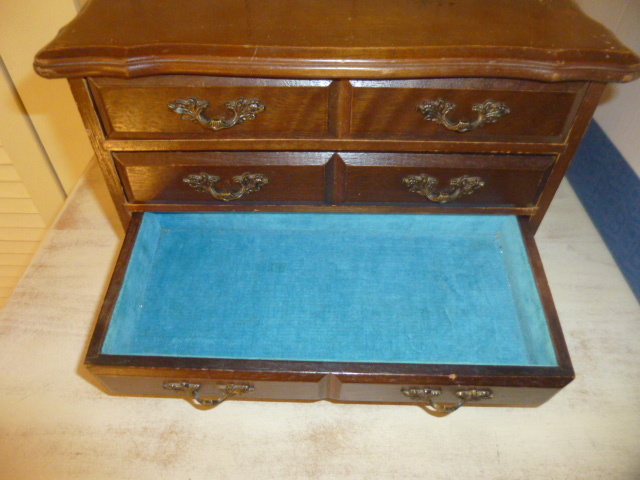 If you answered ‘check the drawers’ you are a TRUE follower of my blog! 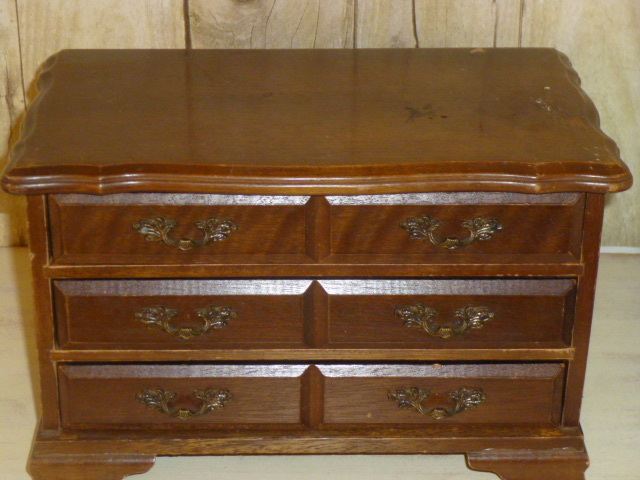 Probably 9 out of 10 jewelry boxes that I look at have ‘icky’ drawer innards. And that cheap velvety fabric (usually bright RED or mustard yellow!) they line the drawers with does NOT come off and is impossible to clean! 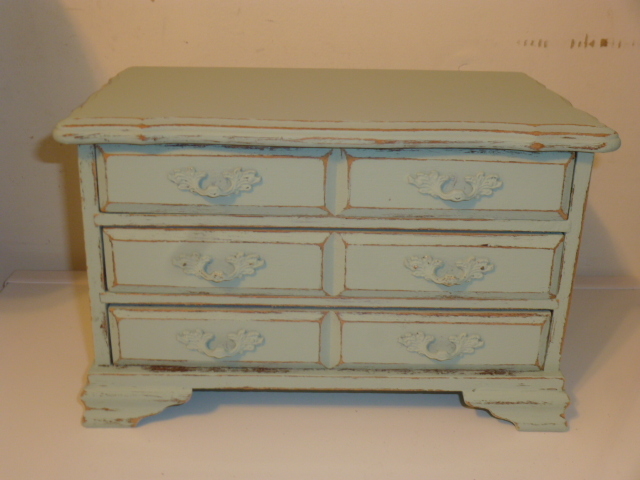 I was absolutely delighted to find CLEAN and TURQUOISE drawers in this one. 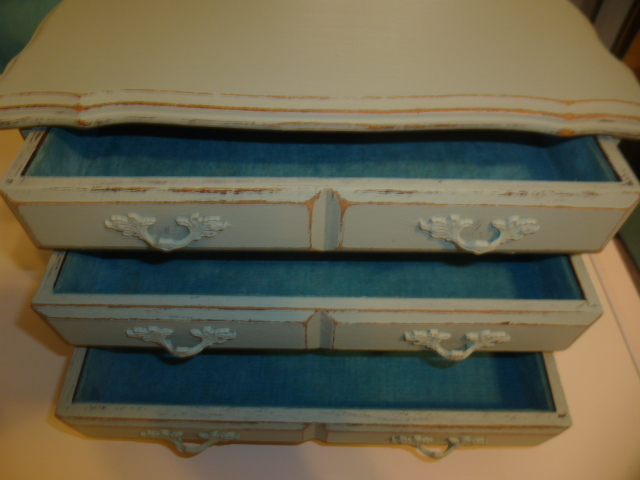 The drawer pulls usually don’t come off, so plan for that in your painting options. I used a small very stiff brush to paint around and behind the drawer pulls; then my regular paint brush for the rest of it. Two coats then hand sanded the edges. Usually I’d stencil a design or word on the top of the jewelry box, but, I’ve decided to ‘leave things plain’ for a while and see if they sell better. If not, I can always add to them later on. This piece will be making its way to my booth at Stars very soon. hahaha new the answer to the popquiz straight away. One lesson ive learnt from you – check the insides of the drawers!